Our mission is to strive to provide functionally-based, evidenced based therapeutic intervention that best meets the varied needs of the individual students we support. 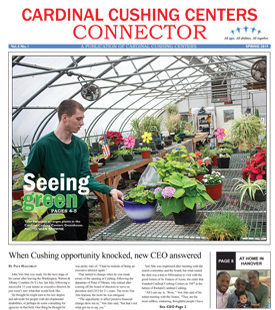 Therapy at Cardinal Cushing Centers may occur within the context of a vocational site, residential unit, community-based activity, in the classroom, or within a therapeutic environment to better promote and support a student’s success and independence. Services provided by this team include Occupational, Speech/Language, and Physical Therapies. Consultation may be provided by our Assistive Technology Specialist. Once our Team determines the needs of each student, his or her educational program may reflect inclusion within our integrated model to support the student’s IEP. To that end, a student’s plan may include a therapeutic trial of service, individual and/or small group therapy, consultation to all areas of his/her program, mealtime monitoring, Activities of Daily Living (meal preparation, cooking, hygiene, and/or community skills) and vocational support.